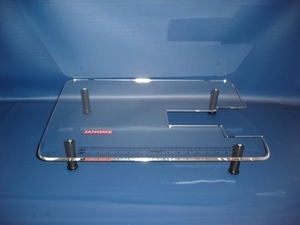 This Table was cut to fit the Janome FM725 and Janome Xpression Felting Machine . These tables are Precut and ready to ship. All of our tables are designed based on having the accessory tray removed from the machine. We position the machine to have the needle around 5”-7” from the front edge of the table. The table encompasses the entire freearm/flatbed sewing surface (does not wrap to the far-right of the machine). If your machine free arm slopes downward and has contours we may choose to design the table to hover over the slope to ensure a perfectly level, smooth sewing surface. If you have a top loading bobbin and a sloped machine this may affect your use. Please contact us in advance for other options. If you are purchasing a Deluxe Table then the holes do not need to be in line with the needle to make circles. I was impressed with the quality of the product, thought that at the price it would be a second. It iw not. Very happy with AllBrands. Received my table and it is PERFECT. Thanks so much for your help. Just couldn't be any happier. AllBrands.com is an independent dealer not associated with Janome.